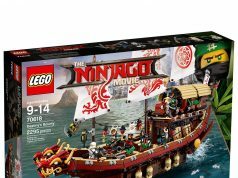 LEGO has issued a new press release regarding The LEGO Ninjago Movie and there’s details on a new set that will be coming this December. The set is called garmadon, Garmadon, GARMADON! which is a play on Benny’s Spaceship, Spaceship, SPACESHIP! (70816) from The LEGO Movie. There’s no images of the set yet but it’ll look similar to the shark mech from the trailer. The set will be available at Toys R Us and on [email protected] for $79.99. In the same press release, there’s also set descriptions and pricing for the other The LEGO Ninjago Movie sets.